Housed in those fabulous prefab buildings of yesteryear, these restaurants greet their guests with good food, down-to-earth atmosphere, and friendly prices. Owner Jamie Floyd keeps the grill going at the Blue Moon Diner in Gardner. This article appears in the Nov. 2 issue of the Magazine. 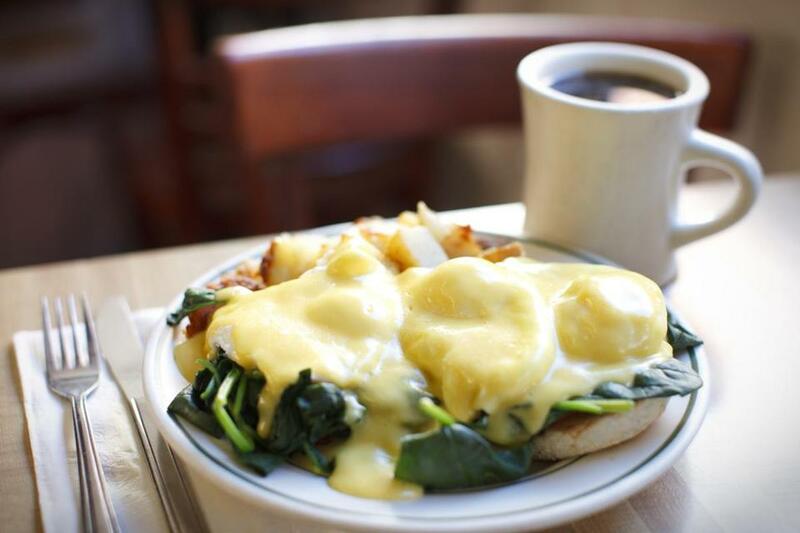 You’ll find homemade dishes from hash to bread pudding at these New England diners. 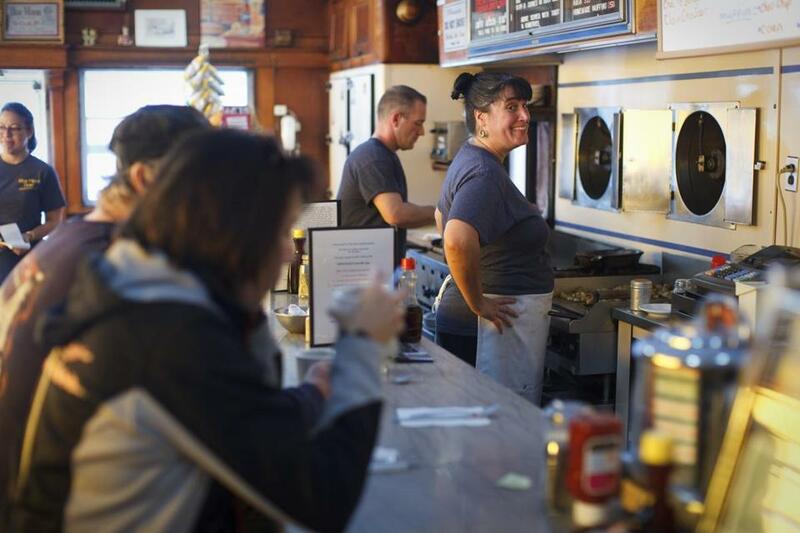 When former waitress Jamie Floyd took over Worcester Lunch Car Co. diner No. 815 (it was built in 1949 and moved to Gardner in 1954), she brought her own style and a flair for comfort-food innovation. Fifties memorabilia abounds, but it’s the Blue Moon menu that keeps diners coming back. Floyd makes her own corned beef and roast beef hash — along with hand-whipped hollandaise and cheese sauces. The hashes are popular with many of the breakfast combos, but they’re the heart of the Webbo. That’s a three-egg omelet filled with your choice of hash, American cheese, and cream cheese. The Webbo at the Blue Moon Diner. Central Massachusetts diners know that when midnight cravings strike for lasagna, manicotti, or stuffed shells, the “Bully” is the answer. This 1936 Worcester Lunch Car diner (No. 730) has been in the George family since 1969. Current owner Jimmy George did a floor-to-ceiling restoration in 1999, the last time the diner closed except for weekly cleaning and Christmas morning. The ovens work overtime cooking roast pork as well as Italian specialties featuring the kitchen’s homemade sauce and meatballs. On Saturdays, George makes the week’s supply of classic diner desserts: Grape-Nuts custard pudding, apple crisp, and bread pudding. 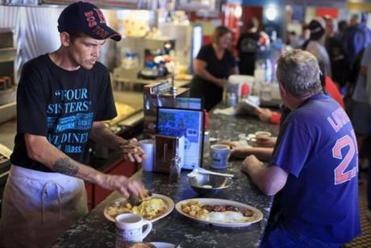 This family-run diner is overseen by Bob Fennell, a state representative by day and occasional short-order cook on weekends. Even when he’s not behind the griddle, his devoted employees keep things chugging along — just look for waitress Joyce, who’s been there roughly 30 years, or Charlene, the diner’s “prep girl,” who’s been there for more than 40. 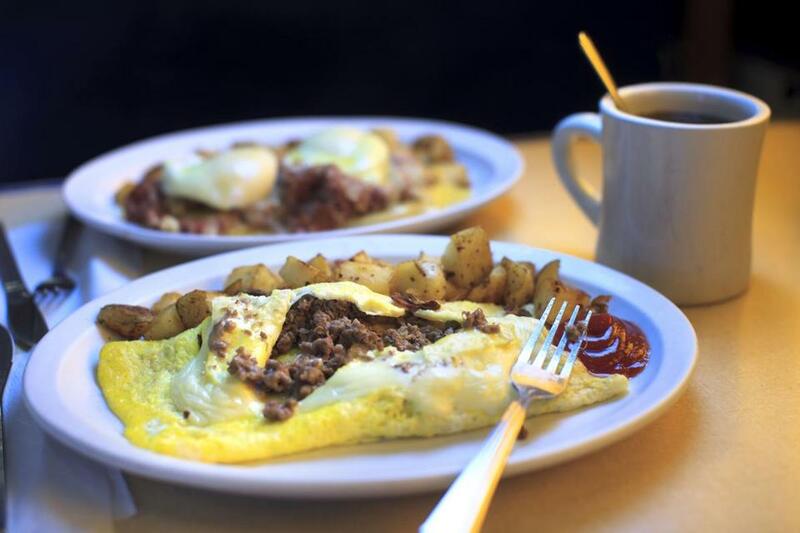 Visit the 1928 Brill diner on a weekend for scratch-made delicacies: traditional, Irish, or Florentine eggs Benedict and Fennell’s own special-recipe Belgian waffles. The waffles are served only on weekends “because we’ve got to give people something to look forward to!” Joyce says with a laugh. Florentine eggs Benedict at Capitol Diner. 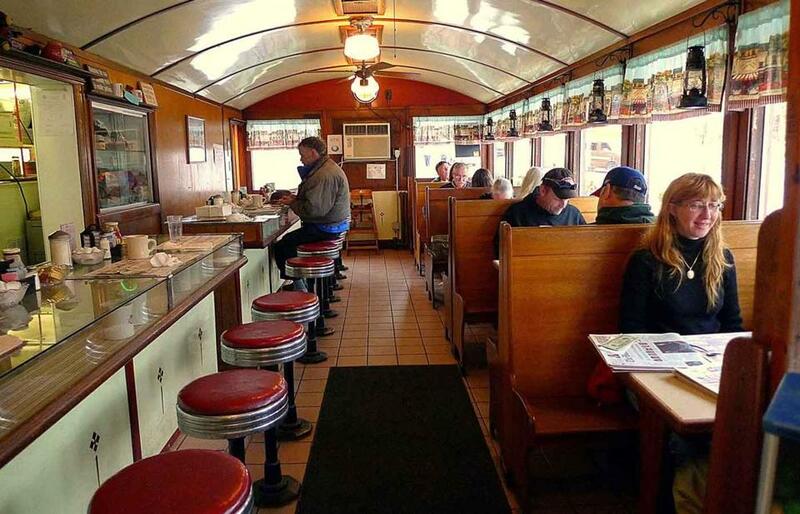 Located in a Worcester Lunch Car, with an addition built in 1947, the Town Diner gained the word “Deluxe” when husband-and-wife team Don and Daryl Levy bought the place in 2000. They have since created a menu that lives up to the name — seven packed pages of cultivated comfort-food offerings, including a Wagyu beef burger, house-made crab cakes, and a salmon BLT with lemon caper vinaigrette. But if you ask Don for a recommendation, he’ll steer you toward the signature flapjacks, made with both sour cream and buttermilk and filled with a choice of bananas, blueberries, chocolate chips, or pecans. And what does he recommend for dinner? “Pancakes are great for dinner,” he says. We couldn’t agree more. Signature flapjacks at Deluxe Town Diner. David Ness prepares orders at Four Sisters Owl. Forgive the pun: The Owl is a hoot. Just picture Cheers with home fries instead of beer. Owner Tom Shanahan treats everyone who ducks into his Worcester Lunch Car like long-lost family, and in this tightknit community, they often are. His customers dish it right back. (“Hey, aren’t you Micky Ward’s sister?” someone cries to a smiley woman behind the counter.) Order the House Sandwich, a roll stuffed with house-baked ham, cheese, mayo, lettuce, and tomato. 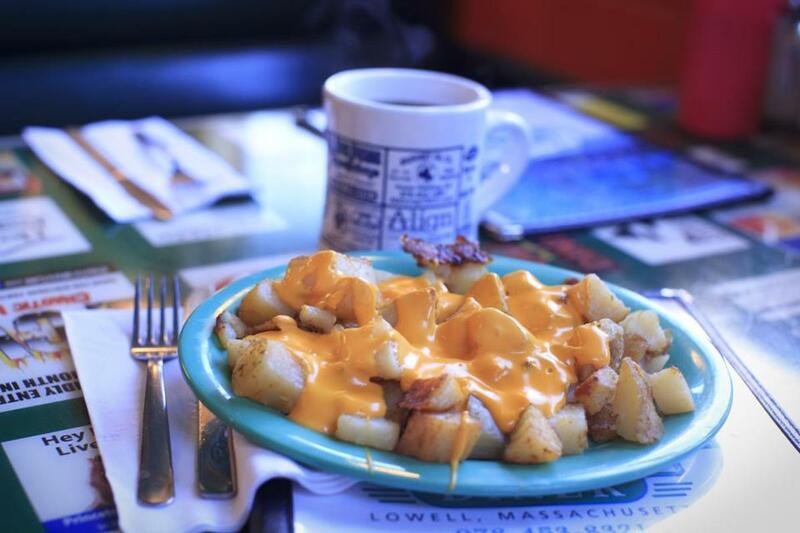 If you’re truly hungry, pair it with Tom’s Special, home fries topped with bacon and cheddar cheese. Home fries topped with bacon and cheddar cheese at Four Sisters Owl. In 2004, when Agachai “Max” Katong took over Worcester Lunch Car No. 834, a stainless-steel and blue-enamel diner, customers came expecting eggs and bagels — only to find pad Thai and northern Thai curries. But dishes like Ba Mee Gra Pow (stir-fried egg noodle, chicken, string beans, and basil) caught on, and the 28 seats fill up at lunch and dinner. Unlike typical griddle fare, Lanna Thai’s dishes are cooked in two woks, so orders don’t reach the table at the same time. No matter — bring your own wine and enjoy the aromas wafting from the kitchen. 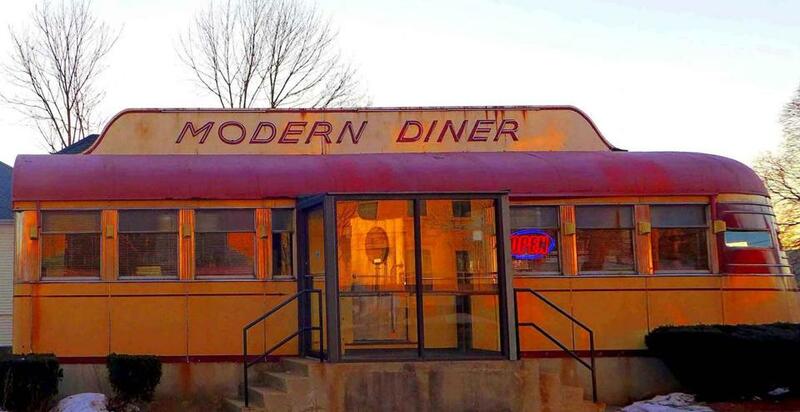 The diner’s Art Deco sign lends an Edward Hopper touch to this sleepy burg on the outskirts of Northampton, where generations of bleary-eyed Five College students have packed the Worcester Lunch Car No. 818 for homemade corned beef hash. It’s a glorious mound of brisket cooked low and slow, a staple dating from the 1940s. (Manager John Zantouliadis says that “Eddie the Butcher” — a neighbor related to the original owners, the Alexander family — slipped him the recipe.) True gluttons should request the Breakfast Club, stacks of homemade French toast layered with eggs, sausage, and bacon. “It’s not the easiest sandwich to put together,” Zantouliadis admits. From the street, the 1941 Rosebud (Worcester Lunch Car No. 773) looks almost new. A recent overhaul of the Davis Square landmark keeps the spirit of the interior — tufted red-vinyl banquettes, black tables with stainless-steel edging — intact. It also improves flow to the big extension out back, which contains a long bar, and a kitchen where a barbecue smoker figures in the meta-diner menu. St. Louis ribs and smoked chicken rank high on chef-partner John Delpha’s list of favorites, along with bacon-filled meatloaf on mashed potatoes with poblano chili gravy. Grapefruit caramel meringue, one of several unusual pies, might be the next great sugar overload. 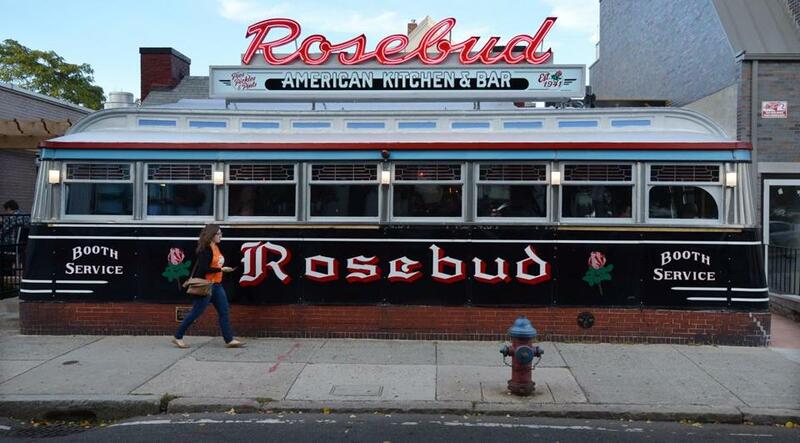 A recent overhaul of the Rosebud American Kitchen & Bar in Davis Square keeps the spirit of the interior — tufted red-vinyl banquettes, black tables with stainless-steel edging — intact. Seven years ago, Tom Manning returned to his native Maine, quitting a 32-year publishing career at Newsweek to restore a childhood memory (Worcester Lunch Car Co. No. 818) that had been closed for several years. “I wanted to do something good for the city I loved,” he says. Indeed. Tucked into a neighborhood of office buildings and chain stores, Miss Portland provides a respite from the gastro-snobbery pervading the little city of late. But foodies do flock here for the house specialty, a slow-cooked corned beef hash, made in-house from Manning’s recipe. It’s delicious and sports the pleasing consistency of a good potato latke. “Each piece of corned beef is shredded with love,” says front-of-the-house manager Susie Kiehn-Geary. This 1961 Paramount diner is a magnet for most candidates stumping in the New Hampshire primaries. And the food here keeps them fueled up for all that handshaking. Almost everything on the extensive menu is made from scratch, including such New England specialties as clam chowder (on Fridays), codfish cakes, baked beans, and deep-fried chicken croquettes. Co-owner Chuck Criss, a graduate of the Culinary Institute of America, even pickles his own tripe for the fried tripe. Lindy’s baker makes all the desserts, including apple pie, which is available with ice cream or (for a real Yankee touch) with a slice of cheese. 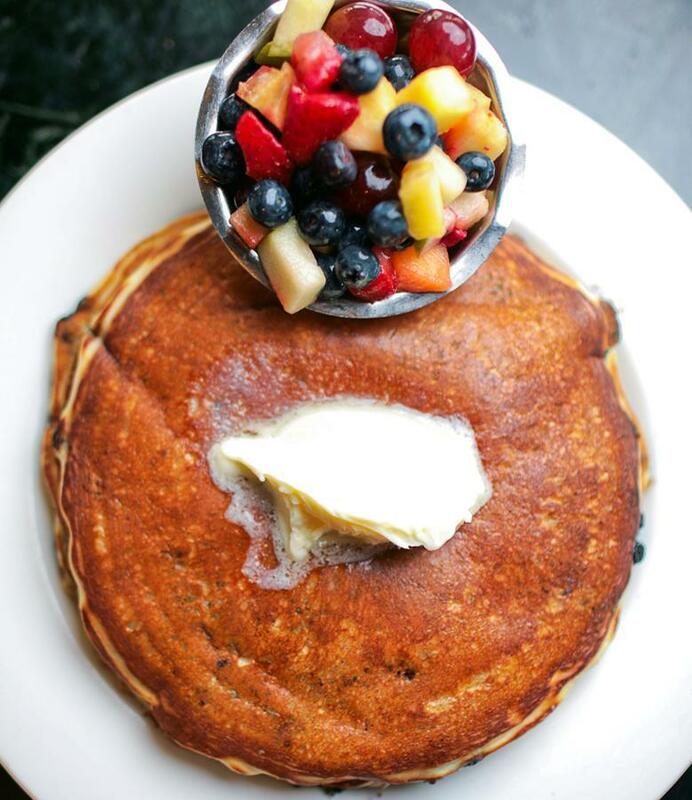 Littleton Diner serves breakfast all day, so it’s never too late to sample the whole wheat or nuttier buckwheat pancakes made with flour from Littleton Grist Mill. There’s been a diner here since 1930, but the current Sterling dining car, made in Massachusetts, was assembled on-site in 1940. Co-owners Chris and Patti Williford uphold diner tradition by making such classics as meatloaf and corned beef hash from scratch. Ever-popular turkey dinners feature birds fresh-roasted in the back. Patti’s sweet tooth shows in the luscious carrot cake and whoopie pies she whips up for dessert. The Littleton Diner is a beautifully restored 1940 Sterling diner. The name harks back to Vilgot “Jigger” Lindberg’s hot dog and burger eatery of 1917, but the diner itself — Worcester Lunch Car Co. No. 826 — arrived in 1950. Owners Karie and Stephen Head offer the old-fashioned Rhode Island specialty of johnnycakes, which are made with white cornmeal milled from heritage corn by Kenyon’s Grist Mill in West Kingston. Inventive and health-conscious, Karie keeps the comfort-food menu up to date. A popular post-gym workout lunch is the Superfoods Omelet filled with shredded red and green kale, Brussels sprouts, broccoli, spinach, tomato, and feta, then topped with sliced avocado. Built just before World War II, the Modern is one of the last Sterling Streamliners still in operation. Roland L. Stickney’s 1939 design is celebrating its 75th anniversary this year, but the car still looks like it could hurtle down a railroad track. (The attached annex is less streamlined.) 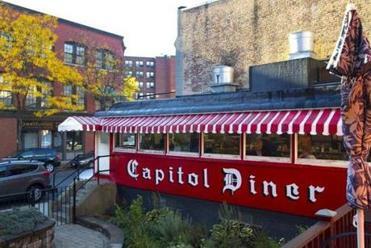 The menu has all the diner classics and a few dozen “specials” — all of them considered signature dishes by the cooks — offered on laminated placards. At weekend brunch, diners enjoy such updated twists on breakfast standbys as lobster eggs Benedict or bourbon custard French toast. When the Monroes took over this 1948 Silk City diner almost 41 years ago, they fed the meat-and-potatoes crowd. Though they’ve gradually expanded their offerings, they’ve managed to stay small and cozy: “Friendliness takes up most of the space,” says the menu. Locals, college students, and tourists wait together for the call of “Next booth!” to tuck into freshly fried doughnuts, crisp cumin-scented falafel, or liver smothered with onions, bacon, and pepper-flecked gravy. Regulars and alumni treasure the table-side jukeboxes and signs plastering the wall announcing specials like pecan-pumpkin pancakes, coconut custard pie, or turkey hash carved from a 40-pound bird roasted daily. Proud members of the farm-to-table Vermont Fresh Network, Todd Darrah and Janet Picard serve up a big slice of local at their diner, where chickens out back lay eggs for specials like a harvest omelet with cheddar, grilled ham, and apples. Picard’s daughter cultivates a quarter-acre vegetable plot within view of the 1939 Worcester Lunch Car diner, and meat chickens raised on-site are roasted, fried, and potpied. One nearby farm provides grass-fed beef for juicy burgers and smoked brisket specials. Others deliver fruit and maple syrup for jams and pies like apple or maple-walnut, best with a scoop of their freshly churned ice cream. Corey Gottfried grew up eating at a local diner and fell in love: “I like the food. I like the atmosphere. I like the people.” After 20 years spent working for others in food service, he took over the Parkway (Worcester Lunch Car No. 839) just under a year ago and has focused on basics done right. He slow-roasts spice-rubbed brisket for corned beef hash and whisks up creamy sausage gravy to ladle over griddled cheddar biscuits. His hot turkey sandwich stars freshly roasted meat on thick white bread with rich stock-based gravy and hand-cut fries. Even vegetarians get house-made seitan in their barbecue sandwich. - Clover Food Lab’s secret ingredient? Data. Lots of it.